Chirico is awoken from cold sleep and separated from Fyana. His attempts to find her come to the attention of a Nextant, the replacement for the Perfect Soldier program. At the same time, the new Pope is to be nominated, and Chirico is religiously considered to be "The Untouchable". With one of the nominees related to the Nextant, Chirico's actions will have far-reaching political ramifications. TLDR: Shining Heresy is a 5-episode OVA series that is a good 2 episodes too long, choosing to focus on dull church bureaucracy rather than Chirico or interesting mech action scenes. The strongest two arcs of the original VOTOMS TV series were easily the middle two arcs (Kummen and Sunsa) in which Chirico is rivalled by Ypsilon for the affections of Fyana. It's an oddly engaging love triangle stuck in the middle of a real robot series that focuses on the mentality of a soldier. Shining Heresy attempts to go back to this by introducing a new rival for Chirico in the form of Teitania, a "Nextant" who was created ostensibly for the purpose of replacing ATs and I guess also destroying Chirico. However, it also incorporates notes of the Woodo arc of the VOTOMS TV show by setting her up as a female love interest for Chirico. This is done in the most awkward and illogical way possible; Teitania literally falls in love with Chirico for no really good reason after he shoots her. Let me emphasize that Teitania sees Chirico like two times and is shot by him before falling madly in love with him and deciding to follow him forever. It makes Fyana's reasons for loving Chirico seem completely legitimate. The biggest problem with Shining Heresy is that it is not about Chirico. Chirico barely ever appears on screen; the other characters certainly do a lot of TALKING about Chirico but the focus of the OVA is clearly on a completely unrelated story about "The Catholic Church, Except In Space" and a yawn-worthy competition over who is going to become the next Space Pope. To the OVA's credit, the original VOTOMS show did not really explore the role of religion in the VOTOMS universe so in theory it's a cool idea to explore it, but the problem is there's no context given. Why does this church matter? What do they control? What are the stakes at hand in this competition to kill Chirico in order to become the next Space Pope? None of these questions are resolved by the end. Oh yeah, Fyana is there too. But she has like a total of 5 lines and is pretty much just a plot device. I won't spoil what happens but the conclusion of Shining Heresy left me scratching my head and wondering "OK, but why?" Well, the answer to that question seems to be that the writers wanted to take Fyana out of the story and replace her with Teitania. Seeing as VOTOMS is about Chirico, that is the only major development that has transpired by the end of this OVA, and one wonders why the writers felt the need for this development. Sure, Fyana wasn't the best character, but she was Fyana! 50 episodes and several OVAs of Chirico chasing Fyana, and for what? The art and sound are OK for a 90's OVA; it's obviously a low-budget production but nothing stands out as ugly. There's a new OP that isn't quite as catchy as the original OP but is still listenable. The scarce few mech battles are pretty interesting as far as VOTOMS go, and I honestly thought Teitania vs. Chirico in episode 1 was the highlight of the whole thing. Overall, it has a few fun action sequences but they're stuck in a swamp of boring dialogue about Space Catholicsm. It tries to ambitiously explore the role of religion in the VOTOMS world but it fails to properly provide context for why the story being presented matters at all. Still, if you plan to watch the other VOTOMS OVAs after this one, you may want to just grit your teeth and bear with it for the major plot development that occurs in Shining Heresy. What we get out of The Shining Heresy is disappointing compared to the show it branches from, Armored Trooper VOTOMS. Despite being full of missed opportunities to expand on the story of VOTOMS and the previous OVAs based on the series, watching this one still has its own merits. The story is the biggest and probably only major weak point in The Shining Heresy as a whole. Shining Heresy's writers had to fish for a new conflict to make the next entry in VOTOMS ripe for watching and ultimately decided to turn the Space Church into a major factor, something that was pretty much only mentioned in the original show. After a number of asspulls with Chirico and his immortality it was decided that he was a freak of nature and was deemed untouchable, and a Nextant (which is basically a human AT and the successor to the PS program, I have to admit it's actually a really badass concept) named Teitania is sent to either convert Chirico to their religion or exterminate him. The reason for this despite marking him as untouchable either wasn't there at all or it just slipped past me and I really don't want to go back just to find out. 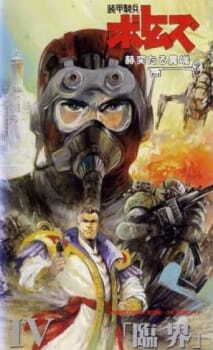 A big part of the original VOTOMS story was Chirico's struggle to be with Fyana, who he fell in love with.. After seeing the two finally get together following being hunted down by entire armies, then subsequently watching The Shining Heresy you'll feel pretty duped because Teitania ends up replacing Fyana as Chirico's love interest only after they try to kill each other a few times or something. I don't mind good endings or sad endings but when one is already established and then soiled by another story it only comes off as frustrating to me. In just 5 episodes there is enough to keep you entertained and maintain a continuous interest in watching however. Seeing the evolution of VOTOMS from the 1980s to the 1990s standard is really fulfilling in its own right and through time it still stays true to what made the original series so good, with its gritty combat and emulation of real war's expendable nature. Along with that it still has its jazzy soundtrack that works so well with the series and a new opening that I must admit I like better than Honoo no Sadame after hearing it so much. If you're a fan and you want something that looks and sounds good, even if it doesn't really FEEL good, The Shining Heresy will satisfy you. If you're not interested after seeing this review take my advice, and let the story end where the show ends.